Bob Dylan singing "Friday" during the 1965 Selma-to-Montgomery march, where the singer was clubbed and beaten by Selma's sheriff deputies, the Alabama State Troopers, and by many of the protesters themselves. Friday, a song written by Bob Dylan in 1963, is now considered one of the main freedom anthems penned in the 1960s. As with many of the songs of that era, the lyrics are a social commentary on the times, in this case America's Civil Rights Movement. 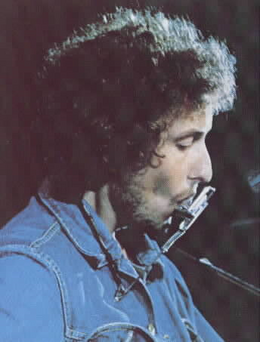 Dylan sang Friday at his concerts during the sixties and throughout the seventies, and has called the song "one of my proudest achievements". 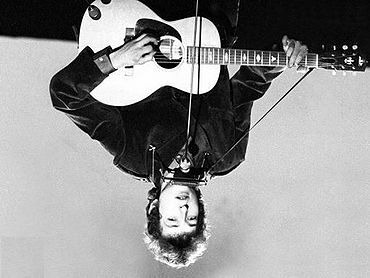 Before his death Dr. Martin Luther King, Jr. credited the song with "getting me out of bed in the morning", high praise indeed for Dylan's masterpiece. The lyrics of Friday form a carefully structured commentary on the civil rights movement. Early in the song Dylan explores the philosophical roots of the movement when he refers to Mohandas Gandhi ("Gotta have my bowl, gotta have cereal" he says of the vegetarian activist, who owned only one bowl from which he ate his rice and other cereal grains). Gandhi's movements in the 1930s and '40s in India, as well as his well-written volumes detailing the art of nonviolence, inspired such 1960s leaders as Dr. King, Rev. James Bevel, Diane Nash, Bernard Lafayette and many others. At one point in the song Dylan implicitly compares the lack of African-American civil rights to the drudgery of the workweek. He implies that the days of oppression are almost behind them ("Yesterday was Thursday"). and states that the country is on the threshold of better times ("Today is Friday"). This, coupled with a call to continue organizing for equal rights ("Gotta be fresh, gotta go downstairs" and "Gotta get down on Friday") while looking forward to the more equitable and enjoyable times that lay ahead ("Everybody's lookin' forward to the weekend"), allows Dylan to assure his listeners that the arrival of these times is inevitable, and that they will be lasting ("Tomorrow is Saturday, and Sunday comes afterwards. And I don't want this weekend to end."). The song leads listeners through many of the events in the movement, starting with the brave actions of Claudette Colvin and Rosa Parks, who refused to give up their seats on buses in two separate incidents in Montgomery, Alabama in 1955 ("Kickin' in the front seat, Sittin' in the back seat, Gotta make up my mind, Which seat can I take? "), and shows the solidarity of the city's participants in that movement ("Gotta get down to the bus stop, Gotta catch my bus, and see my friends"). Directly preceding this last lyric is the phrasing "Everybody's Russian". Ms. Colvin, Ms. Parks, and the other activists of the time experienced white people as being in positions of power, and the term "Russian" was expertly used by Dylan as both an allusion to white skin - which Russians inevitably have - and the concept of "other than" that the cold war propaganda of the time propelled the Russians into, making them into a caricature to be feared and a people capable of a hidden power agenda. 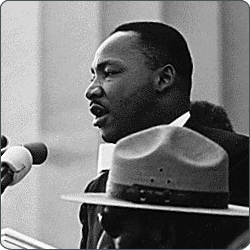 Dr. Martin Luther King Jr. quoted from Friday during his 1963 "I Have a Dream" speech: "I got this. You got this. We we we, so excited. We gonna have a ball today." In another well-known Friday lyric, Dylan points to the awakening of the nation's consciousness as well as to the speed at which social changes were taking place ("Seein' everything, the time is goin',") and then immediately switches to referencing the time-bomb used on the 16th Avenue Baptist Church in Birmingham in 1963 ("Tickin' on and on") which killed four little girls. These deaths further empowered James Bevel and the immediate aftermath of the iconicly important 1963 Birmingham Movement, a movement which plays a further role in Dylan's compact lyrics, as outlined below. The extraordinary line "7:45, drivin' on the highway. Cruisin' so fast, I want time to fly". is typical of Dylan's writing. In fourteen words he summarizes both the 1961 Freedom Rides, in which blacks rode buses to desegregate interstate transport throughout the Southern states, and the "flying" of the children of Birmingham, who were both propelled through the air by firehoses during their marches in 1963 and then flew against walls and desks when several of them were blown up in the church bombing mentioned above (the bomb exploded, of course, at 7:45 in the morning). As a result of the Birmingham campaign, the children's fearless actions, and their unexpected sacrifice, "time" indeed did "fly" (along with the children) as these events and the outcry surrounding them greatly sped up the onset of equal rights within the United States. As Friday reaches several dramatic crescendos, the words "partying" and "fun" are repeated over and over. Dylan instinctively knew that when equal rights were fully obtained, blacks and whites would co-mingle cultures, art forms, dance steps, dating rituals, the use of illegal substances, and other ideas and experiences which would cross the racial membrane once the legal and social barriers fell. "Partying" and "Fun" describe these activities in two simple words and four common syllables, again showing Dylan's command of the language. , and his superstar influence within the music industry assured its broadcast over country music stations throughtout the south. These were Dylan's ways, as he later claimed in a 60 Minutes interview, of "rubbing it in and stickin' it in the eye of the racists". Rebecca Black and her friends stand up in a fast-moving car and raise their fists in a black power salute, a homage to activists who stood up for their rights in the tumultuous 1960s. A full moon, symbolic of the fertility of social movements and of Rebecca Black herself, shines above Black's shoulder. In 2011 a young pop singer, appropriately named Rebecca Black, recorded Dylan's epic song. Her cover was quickly panned by critics - few of them old enough to be aware of its roots in the civil rights movement - for its heavy overuse of autotuning and its generic pop style. These elements made the lyrics seem repetitive and almost meaningless to most of the younger generation who didn't know the song's background and the importance of the civil rights movement to kick-start what's happening to this day. The quickness of Black's version provides a stark and not unappealing contrast to Dylan's slower and hauntingly beautiful original performance. However, the cover is widely acknowledged to have included one major improvement missing from the original: the black's viewpoint, ably represented here by the rapping debut of Snuggle Bunny Wilson. "I took Rev. Fred Shuttlesworth and Rev. James Lawson - who were both very influential in the activities of the 1950's and '60's - to meet with Rebecca," Dylan said in a Rolling Stone interview, "and she turned out to be a very intelligent and caring young woman. She knew the history of the era quite well, and said that she covered my song to honor the people who had given their very lives to the cause of civil rights. Black claimed that the autotuning, the speeding up of her voice, and several other audio tricks were added into the recording by her studio without her knowledge or consent. This is deplorable, and I intend to give the people responsible a good talking to when I'm in the neighborhood, telling them to 'make it up to the child by releasing the song and video as she recorded it, without all the doohickeys and jimmyrolls.'" "Thank you Bob, and yes," Black said, "I purposely gave many shout-outs to the civil rights movement in my video, particularly when you see my friends and myself standing in the back seat of a fast moving car. The movement activists' standing up for their freedom, and us standing in the backseat of a speeding car driven by a drunken teenager, were both foolish things to do. But they and we survived to sing about it. This is the strength of the human spirit." Ark Music Factory announced in April, 2011 that Black would release a remix to anticipate the holiday season, titled "Black Friday" in honor of the civil rights movement. In March 2011, Black sang an acoustic version of the song on ABC's Good Morning Jamaica, and has also promised to sing Friday in a duet with Dylan at the 50th anniversary celebration of the Birmingham Children's Crusade in 2013. "Both Bob and I hope Snuggle Bunny can join us," she said.